Diversity: How far should you go? In terms of new-vehicle sales, people-movers don’t add up to much these days. With an almost-transparent sliver of the Australian market amounting to around one per cent, you’re left wondering why the few remaining stalwarts in the segment even bother. Considering that medium and large SUVs take a 28 per cent bite out of the pie, followed by small cars ingesting another 18 per cent, and 4×2 and 4×4 workhorse pickups gobbling up around 17 per cent, it’s clear where most Australian buyer intentions lie. Although most of the work today in the people-mover segment is being done by Kia’s remarkably successful Carnival and Honda’s long-running Odyssey, a number of others are out to grab a share of the minuscule market. These include the still-extant Tarago, Volkswagen’s Multivan – which has historical roots dating back to the revered Kombi van – and van-based entrants such as the Chinese LDV G10 and Hyundai’s iMax. Tailing along at the back of the field there is the lovable, strangely-titled and very French Citroen Grand C4 Picasso. For this comparison, we decided to cherry-pick three of the best representatives from three disparate people-mover types: The tending-to-quirky Citroen Grand C4 Picasso, the modified commercial van that is the Hyundai iMax and the purpose-built Kia Carnival. Though the three vehicles being compared here are quite different in approach they do, apart from the generally more expensive Kia Carnival, occupy a similar pricing spectrum. Diesel engines are available in all, but the more commercially-oriented Hyundai iMax doesn’t offer the option of petrol power that is offered in both Citroen and Kia. The line-up includes the 1.6 litre turbo-petrol Grand C4 Picasso, Hyundai’s 2.5-litre turbo-diesel iMax and the 2.2-litre turbo-diesel Kia Carnival. We are comparing them to illustrate that, although people movers are fundamentally designed to carry people, it’s not a matter of one size fits all. The intentions behind Hyundai’s iMax are markedly different to those of the Citroen Grand C4 Picasso: the Hyundai takes eight people, easily, while the Citroen will carry seven at a pinch. And although the Kia Carnival seats eight with comfort, it’s done in an entirely different way, with entirely different results, to the big, angular Hyundai. What we are attempting here is to suggest the best way of spending your 40 to 50 grand if it’s a people-mover you want, but have specific needs beyond merely carrying as many passengers as possible. The crunch comes when you consider the possibilities of all three: Let’s consider the noticeably smaller (4.6m long compared to around 5.1m for the Hyundai and Kia) Citroen for a start. Lower, at a bit more than 1.6m tall (Hyundai 1.9m, Kia on the way to 1.8m), and more car-like with its conventionally-hinged rear doors, it’s less of a fuss to get on board. A vertical-folding arrangement for the individually-adjustable 40:20:40 centre-row seats enables quite easy access to the two rearmost seats. Problem is, when you get there, there’s not a lot of room for the feet, head or shoulders and there’s a big centre gap prone to dropping stuff in, then losing it. The Grand C4 Picasso is suited to five passengers on a long haul, and seven only for short distances. The boot, with rear seats in place, is 165 litres small, but it can be extended to an impressive 2181 litres by folding the second and third rows to form a flat, long and useful floor. And, as for lugging a small camper-trailer, the Citroen is limited to 800kg (although the diesel version will haul a reasonable 1300kg). The Hyundai has no such problems. There’s copious space for eight lanky adults all-up on large, properly-cushioned seats. But the van origins show through via a big climb up from the kerb that virtually sidelines older passengers, and the muscle needed to fold forward the heavy, 60:40 centre-row cushions for access to the back seat – a single, fixed arrangement that can’t be folded or moved to enlarge the load space. You’re stuck with a big, vertically-configured but non-extendable 842-litre boot and that’s all. We didn’t try it, but a mountain bike would be a struggle. So, if you’re one of those families with a team of adolescent basketball players looking to stretch their limbs on an extended road trip, the iMax would suit nicely, although the towing capacity, at 1500kg, is quite a bit less than the Kia. Four airbags and a four-star ANCAP safety rating don’t look good against the six-airbag, five-star Citroen and Kia either. Then there’s the massively successful Kia Carnival. Claiming around 43 per cent of the entire people-mover segment in 2017, the eight-seater is an important fixture in Kia’s model line-up that multi-tasks with ease as a passenger car, or as a truly spacious conveyance for an extended family. The Carnival has an on-road poise that will win over many a driver and, like most Kias, looks good into the bargain. Even at its minimum, the load capacity is a remarkable, vertically-oriented 960 litres, extending through 2220 litres with the third-row folded away to as much as 4022 litres with all seats folded. Climate-control vents, roof-mounted in the second and third rows, are provided for all passengers, with second-row adjustment provided in the right-side door pillar. And the braked towing capacity is well in excess of Citroen and Hyundai at a useful 2000kg. 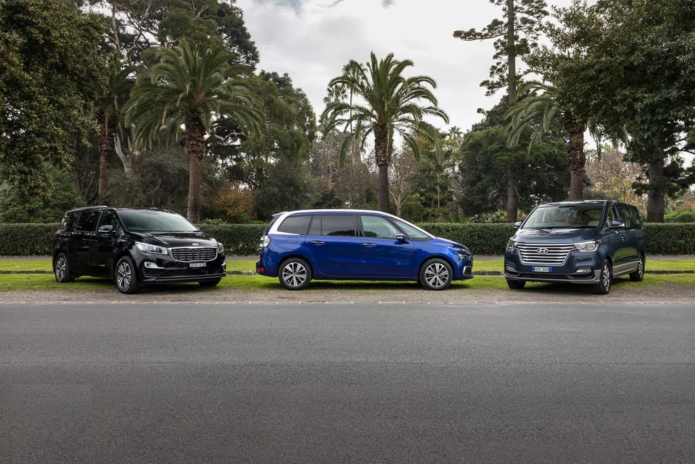 The Exclusive spec-only turbo-petrol Grand C4 Picasso is ticketed, before on-road costs, at $38,490, while the premium-spec Hyundai iMax Elite is $48,490 and the mid-range turbo-diesel Kia Carnival SLi is $54,990. To level the playing field a little, the (also Exclusive-spec) 110kW/370Nm 2.0-litre turbo-diesel Citroen, which we didn’t test here, is tagged at $44,490. Somewhat disturbingly, the 121kW/240Nm turbo-petrol Citroen misses out on autonomous emergency braking and adaptive cruise control, which are standard on the turbo-diesel version – though it does come with lane-departure warning and lane-keep assist, blind-spot monitoring, front and side cameras, and self-parking capability. Helping minimise any feelings of being short-changed, sat-nav, a (fixed) panoramic sunroof, Apple CarPlay/Android Auto functionality, side and rear window blinds, and a cooled glovebox are standard in the Grand C4 Picasso. It comes as no great shock to find that the Hyundai iMax lacks autonomous emergency braking, adaptive cruise control, lane-departure warning and blind-spot monitoring. A reversing camera is about the only concession to (relatively) new-generation safety aids. Sat-nav is optional, the second and third-row windows are hinge-open only and just the driver’s window offers an auto up-down function. Roof air vents with separate controls are provided for second and third-row passengers, and the Elite version does get heated front seats and a dual-pane sunroof. A bigger development budget would have helped make the iMax a more refined, and more versatile as a luggage carrier. That fixed rear seat is a big impediment to its overall versatility. While a six-speed manual version is available with a 100kW/343Nm 2.5-litre turbo-diesel, our five-speed auto iMax came with the higher-output 125kW/441Nm variable-geometry version. The Kia Carnival’s extensive model range (S, Si, SLi, and Platinum) includes the 147kW/440Nm 2.2-litre turbo-diesel and a 206kW/336Nm 3.3-litre normally aspirated V6. The diesel SLi Carnival tested here had autonomous emergency braking, active cruise control and lane-departure warning. The Carnival SLi gets sat-nav, partial leather seats with power-adjustment on the driver’s side only, Apple CarPlay/Android Auto, eight-speaker audio and no less than 10 cup holders in all three rows (plus four bottle holders) to attend adequately to passenger hydration needs, although at this level there’s no sunroof option. When it comes to warranties, the Kia stands well above the rest with its seven-year/unlimited-kilometre deal – although Hyundai and Citroen are not ridiculously far behind, both offering a five-years/unlimited-kilometre deal. Kia asks that the Carnival be serviced every 12 months or 15,000km, as does Hyundai with its iLoad, while Citroen, which shares 12-month service scheduling with the Koreans, stretches the distance out to 20,000km. Citroen, Hyundai and Kia all have their specific appeal. The Citroen makes an immediate impression with its immense glasshouse incorporating what are possibly the biggest A-Pillar auxiliary windows in the universe, the stretched-out fixed-glass sunroof, the centre info display with its digital readouts and the powered tailgate. From the front seat in particular, the Citroen feels much bigger than it actually is. It drives well too; the 1.6-litre turbo-petrol works away smoothly in the distance, the steering is well-weighted and responsive and the ride quality is, well, French-comfy. The more it’s driven, the more the Citroen’s allure increases. The Hyundai iMax is marvellously spacious inside, as you’d expect, and the seats, in all rows, are large and supportive with plenty of surrounding space. The dash also includes some soft-touch vinyl in the attempt to contrive a cosy, classy feel and there’s even a cigarette lighter! Yes, the turbo-diesel engine is intrusive, but not too intrusive, and dishes out surprising response given the iMax’s 2230kg kerb weight. The 11.2m turning circle, given the Hyundai’s size, is acceptably tight too. The Kia Carnival, unlike the iMax – and even the Grand C4 Picasso – greets driver and passengers with a familiar, car-like ambience. The smooth eight-speed auto transmission and muted, responsive diesel engine help it drive and feel like a car. Powered, sliding doors give access on both sides, and even those seated way up back have adult-friendly space and are helped getting there via vertical-fold, centre-row seats that move out of the way quickly and easily. Then there’s that cavernous boot behind the third-row seat (accessed buy a power tailgate) and the middle, centre-row seat that can be removed entirely if you want, opening up third-row legroom and gifting the outboard second-row passengers with even more shoulder room. Obviously the Citroen Grand C4 Picasso is not about to pretend it has as much room for people as the Hyundai or Kia. Even the second-row seating struggles with moderately-tall passengers and the luggage space is limited unless you start folding-away the seats. The Hyundai iMax is unable to conceal its commercial van origins. It’s big, but simple, and even though amazingly spacious for eight passengers on cloth-trimmed seats, the manual, sliding doors are a bit ponderous and there’s a serious lack of the load-carrying versatility evident in the Citroen and Kia. It’s the thirstiest too, with an official figure of 8.8L/100km compared to the Kia’s 7.6 and the petrol Citroen’s 6.4. It’s not easy to find fault with the Kia Carnival. If you were nit-picking, you’d impose demerit points for the fact it has the widest turning circle (11.7m) and, at the top end, it’s pretty pricey. Crunch time: Which is best? The outcome of this three-way comparison is really a no-brainer. While the Hyundai iMax is the most spacious of the three, its commercial van roots are always evident in terms of its functionality, passenger access, safety and general drivability, while it is surprisingly compromised when it comes to luggage-carrying. The Citroen Grand C4 Picasso is immensely endearing, versatile and great to live with. But in the end its seven-seat limitations, and the general tightness of space that applies to both second and third rows – particularly the latter – have it yielding first place to the Kia Carnival. The Carnival is a thoroughly well thought-out people-mover with few compromises. And it has a certain street-cred that explains its success, even in a market where multi-passenger SUVs are such a dominant force. The Carnival runs against the tide in many ways. In fact, were VFACTS were to lump its sales performances into the large SUV segment, it would rate in the top 10. It is really the best of both worlds, and arguably the best people-mover not just in this segment, but in the entire market. How much does the 2018 Citroen Grand C4 Picasso Exclusive cost? How much does the 2018 Hyundai iMax Elite cost? How much does the 2018 Kia Carnival SLi cost?